There was once a time when you could confidently name the Acura brand alongside such performance stalwarts such as Lexus, Infiniti and even BMW. But slowly, yet surely, the brand seemed to taper off the performance aspects in favour of a more relaxed, watered down driving experience. For example, the first generation TSX was lauded as one of the best handling front-wheel drive cars of its time. It was available with a slick six-speed manual, was right-sized for a compact sport sedan, and the ability to tune it was as easy as tuning a Civic. Then it morphed into the TLX, which is ostensibly a more luxury packed Honda Accord that would rather coddle than carve a corner with precision. In fact, most of Acura’s lineup seemed to receive the same inevitable fate. 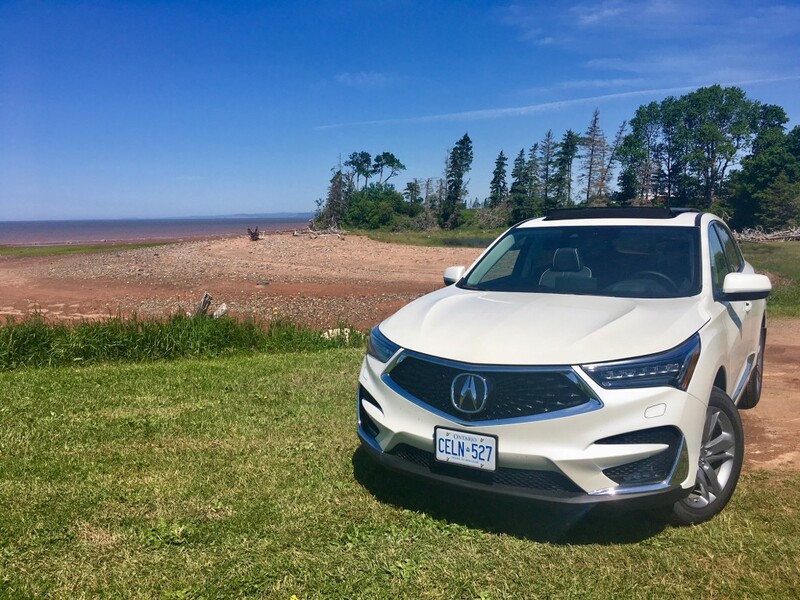 But I’m encouraged by the latest and newest offering from Acura – so much so, that it may even be the best model in the line up. The most shocking part? It’s an SUV. 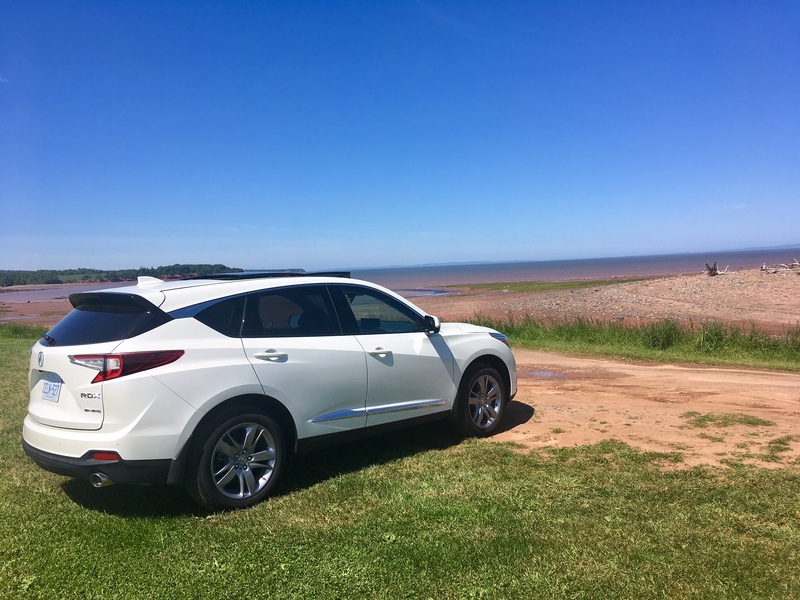 I loathe SUVs for the most part, and if you remember the original TSX, or are just plain a fan of the NSX, then you’ve likely thought I’ve gone mad crowing an SUV as a performance podium finisher. But before we get to that, as always, let’s take a look at the exterior. 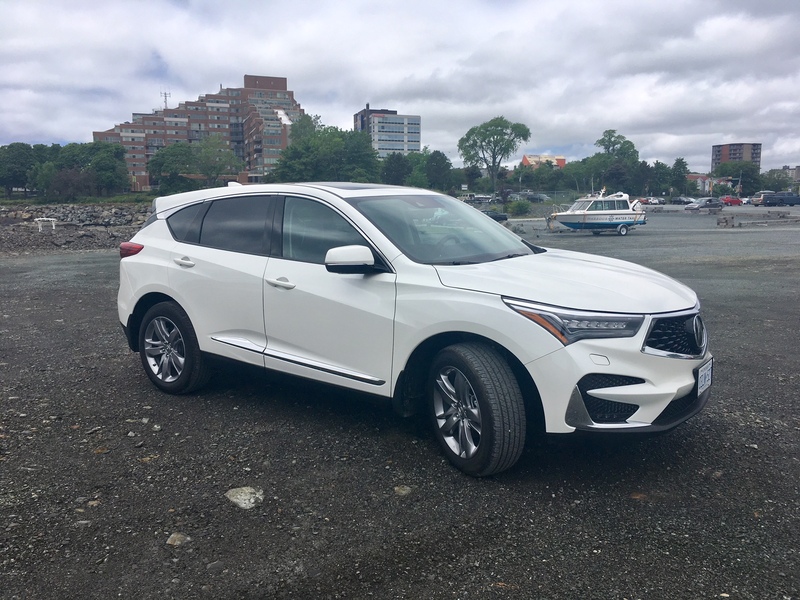 About as surprising as a combative tweet from the U.S. President, Acura has gone and put their new corporate face on the RDX. That means a massive grille with a massive Acura badge housed right in the middle of a piano black eye-catching pattern within the grille itself. 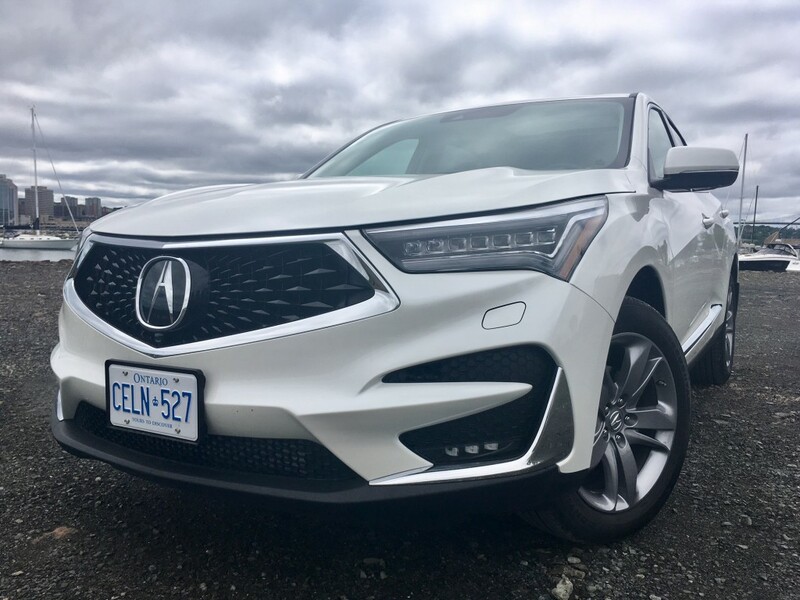 Like the ‘beak shield’ grilles of Acura’s past, this new grille is likely hit or miss depending on your personal tastes, but there’s no question that it garners a fair amount of attention. Full LEDs up front help out with that task as well (LED tail, brake and reverse lights are standard out back, but no LED turn signals for some reason – at least they are properly amber in colour), and the A-spec trim adds black trim, side skirts and other body kit, along with dark coloured 20-inch rims. It looks very good, the A-Spec. And speaking of the rims, my top of the line tester did not come with 20-inch rims. Only the imid-trim A-Spec gets those. For some reason the top trim only gets 19-inch rims and I must say, they look about as interesting as watching a chess game with a gnat. Honestly, this is the RDX’s only downfall when it comes to styling. 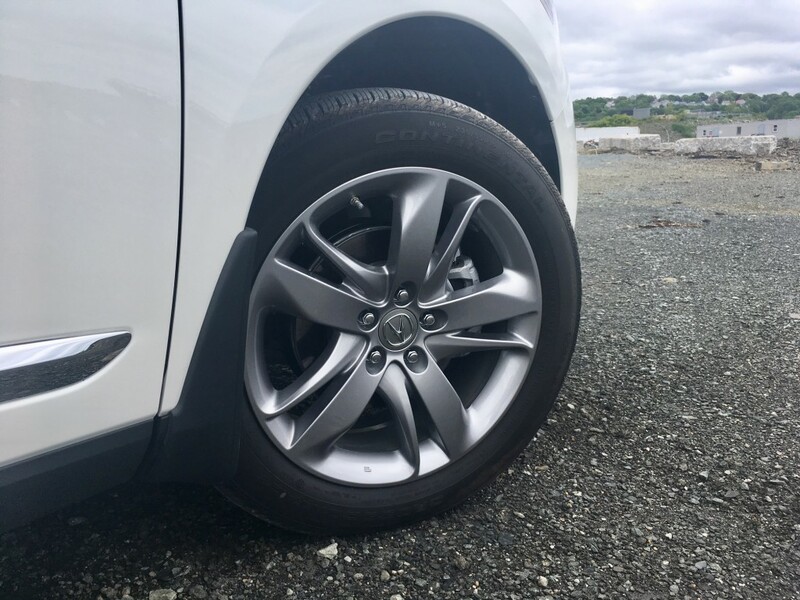 The top trim should get the biggest wheel diameter (or at least as big as other trims) and the wheels should enhance the look of the vehicle. These rims look as if they belong on the base model, but I digress. The interior is completely reworked for 2019 and the first thing your eye will likely notice is the gigantic knob right in the middle of the centre stack. A knob this big and this prominent most have an important job, right? Well, sort of. It is your drive mode selector which allows you to change the characteristic of the RDX. I’m not sure why it’s so big and placed so prominently, but it kinda looks neat. Happily, the confusing dual stack screen set up is gone in favour of a screen tacked on top, as is the trend these days. A push-button gear selector is the name of the game (don’t worry, you get used to it easily), and the rest of the look is complimented by rich leather, curvaceous lines and a sporty looking and feeling steering wheel. Overall, it’s quite posh. The infotainment system is a massive improvement over the old system, which I honestly thought was among the worst in the business, but no longer. The graphics are crisp and easy to read, but the biggest change is how you operate the system. 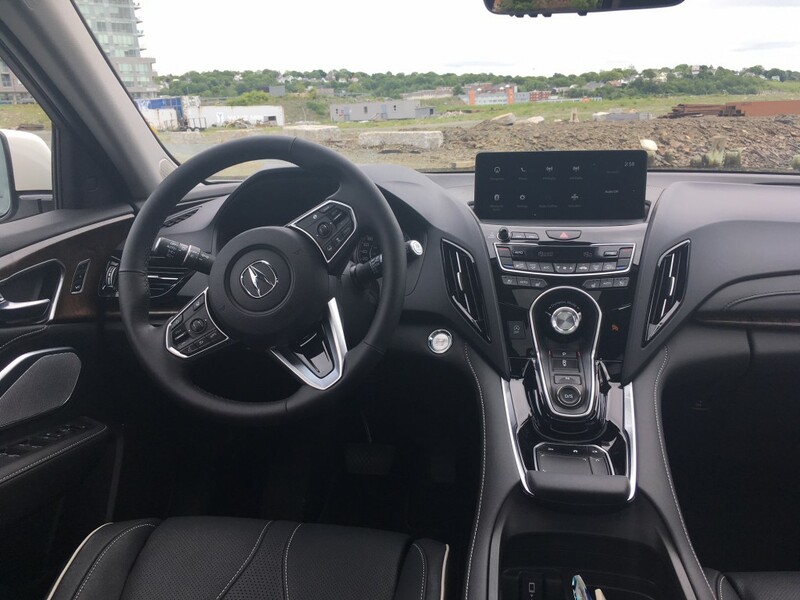 It uses a touch pad placed behind the electronic shifter and uses a 1:1 ratio which is meant to minimize the amount of time your eyes are off the road while using the system. It works as a bit of a touch screen except you are using the pad instead. For example, if you want to select an icon located on the lower right hand of the screen, you would hit the lower right hand of the touch pad to select it. It takes some getting used to, but it does seem to respond quickly and usually on the first try. The pad can also be operated like a normal laptop pad where you can move a curser and point and click. It should be noted that this system is compatible with Apple CarPlay, but Android Auto is not yet available as Google still needs to certify the touchpad operation. 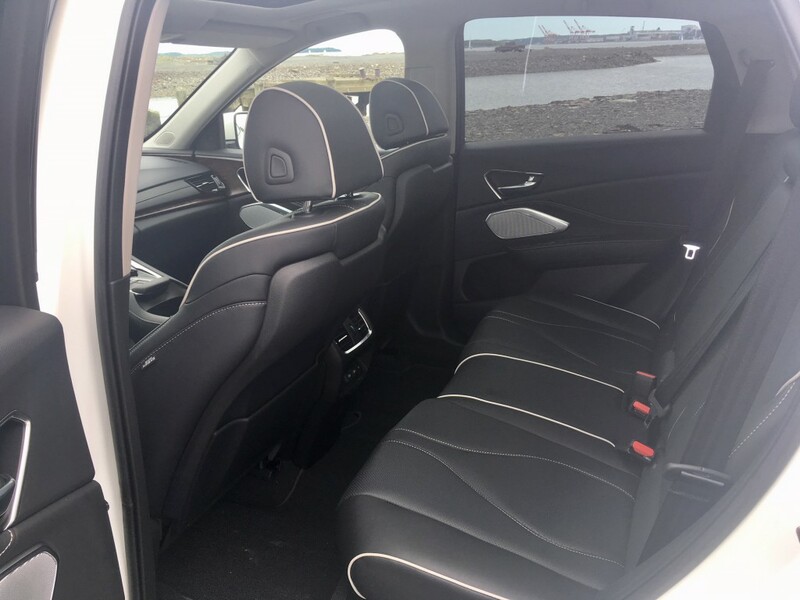 The seats are both supportive and comfortable and can be configured to handle mostly any body type. Leg and head room is good no matter which seat you find yourself in and cargo room is class leading at close to 1,700 L with the seats up, and close the 2,300 L with the seats down. As is the trend in the industry, gone is the V6 in favour of a turbocharged 4-cyclinder. It produces 272 horsepower and 280 pound feet of torque mated to an all-new 10-speed automatic. 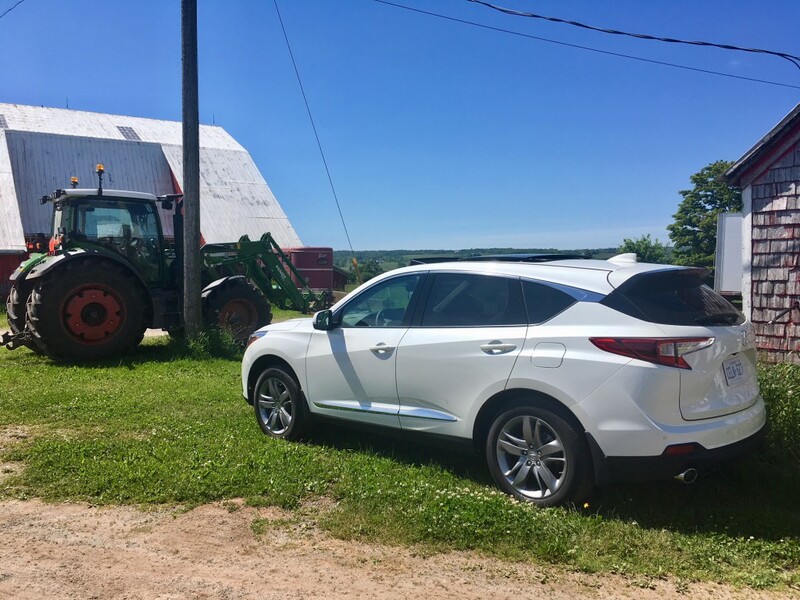 Power is more than adequate and the 10-speed is slick, never holding the RDX back and it always seems to find itself in the proper gear. The RDX is quite agile whether it be setting off from a light, or passing on the highway, there is always power to be had at your disposal. Of course, handling isn’t any SUV’s forte but the RDX might have succeeded at truly bucking that trend. 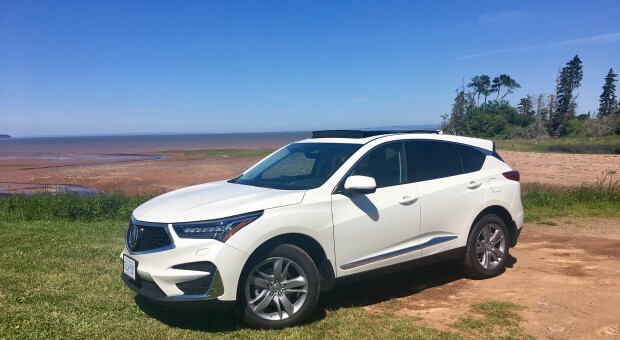 It comes equipped with Acura’s Super Handling All-Wheel drive system, and while the title of the system might seem a bit exaggerated, it certainly still impresses. It can send up to 70% of power to the rear, while 100% of the power can be sent to either the right or left wheel, depending on where it’s most needed. It also has torque vectoring which allows for greater confidence and a quicker turn in. Even the brakes have been reworked. Acura says they’ve managed to reduce the initial bite when the brakes are applied for smoother operation. Overall, this thing is a pleasure to drive. Fuel consumption comes in at 11 L/100 kms city and 8.6 highway. In mixed driving, I managed to return a rather disappointing 11.9 L/100 kms. It should be noted that a fair amount of sprinted driving occurred during my time with it. With a vehicle that handles and performs as well as the RDX does, you won’t be able to help yourself, so prepare to take a hit in this area. There is an eco mode, but you won’t want to use it. It would be a bit like only eating the crust of a pepperoni pizza. Why would anyone do that? And the funny part is, I would always ask ‘why would anyone do that’ when I met someone who traded their performance sedan for an SUV. But the RDX is the first vehicle I’ve driven in some time where I can actually understand where some people might be coming from. 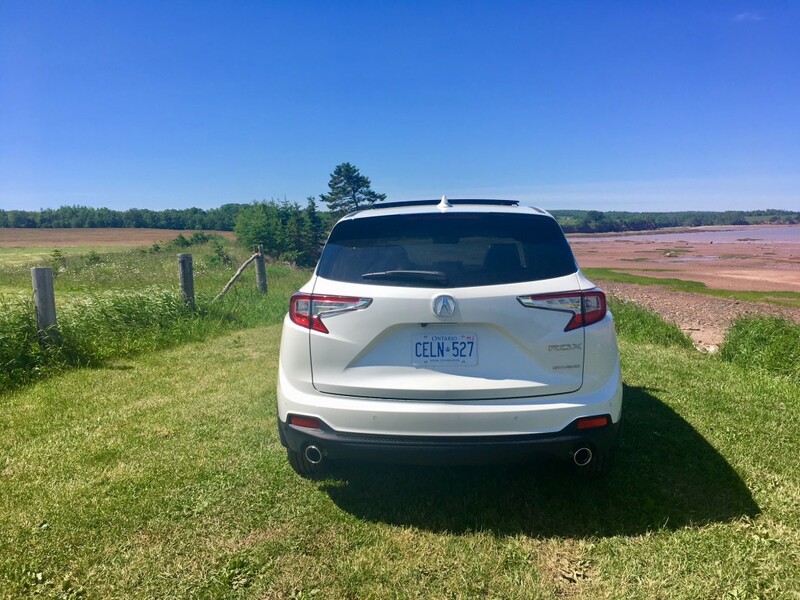 When I first picked up the RDX, it took me all of 13 kilometres to recognize just how engaging the RDX is to drive and how it’s packed full of precision crafted performance. It’s been some time since a vehicle has been able to win me over in such a short period of time. And if you opt for the much better looking A-Spec model, you’ll perhaps find yourself as a first time SUV owner. Though hopefully Acura will now inject the same craft into their sedans. There’s nothing else left to say other than, welcome back, Acura. And well done.